Low Carb Waffles | Double Chocolate! We FINALLY got my dream waffle iron and I have created (just for you), the perfect Low-Carb Waffle recipe! It's double the chocolate and double the fun when you make it in a waffle iron. Since this waffle iron has been a long time coming, we decided to make it a part of our house warming series. Watch me make them below! This is the Best Waffle Recipe! Since getting my waffle iron, I have made countless waffle recipes, from ones I found online to my own creations. However, this is by far the best one. It's indulgent, has a rich chocolate flavor and that perfect waffle texture. The ones I've tried are either too soft, even mushy, or completely dried out. These waffles can be eaten without any syrup or butter and you won't have a dry throat afterwards. They are moist and rich in flavor. What more can you ask for?! I definitely think this low carb waffle recipe is one of our best keto recipes. It is one I can eat at all times of days and can even be made into pancakes for those without a waffle iron. A couple of our other best keto recipes have to be our Macor Cakes, Coconut Curry Chicken, and Cauliflower Mac and Cheese. If those three don't fancy your taste buds, then head over to Ketoco﻿﻿nnect.net to try out some of our other incredible keto recipes! Whether or not you have a waffle iron, you can make this batter into a delicious, chocolate-y breakfast, lunch or dinner! You can easily use the batter to make pancakes so you'll never miss out. The waffle iron we have and I definitely recommend is the Oster 2000 - it was very easy to use even for a newbie like me! You can even make savory waffles, like the zucchini cheddar waffles we will be making for our cook book. Make these low carb waffles or pancakes next time you want to have a guilt-free, indulgent keto meal! Try our Protein Waffles and Cauliflower Waffles! 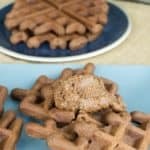 Recipe can be quickly added to MyFitnessPal - Search "KetoConnect - Low Carb Waffles"
Combine coco powder, coconut flour, baking powder and salt in a bowl and set aside. In another bowl add the cream cheese and microwave for 20-30 seconds until soft. Add the eggs and stevia to the same bowl and combine using a hand mixer. Add the dry ingredients to the wet ingredients and combine using hand mixer. Chop up the bakers chocolate and add to a microwave safe bowl. Add the butter to the same bowl and microwave for 40 seconds. Using a spoon combine until butter and chocolate are fully incorporated. Add the chocolate mixture to the batter and combine using a hand mixer. Pour 1/4th of the batter into the center of the hot waffle iron and close the lid. Repeat until all waffles are complete. Serve warm and enjoy! Store left overs in a ziploc bag in the fridge up to 10 days. NOTE: The batter will make 4 medium waffles!